Vegetable Buying Guide First Rule – Demand Freshness! Hints and tips on choosing the freshest produce at the market. Learn how to get the most for your money and how to purchase fresh fruits and vegetables. Check the characteristic signs of freshness such as bright, lively color and crispness. Vegetables are usually at their best quality and price at the peak of their season. Fresh vegetables are key ingredients in the kitchen. With the right preparation and some of your homemade creativity, they make everyday meals just as magical as special occasions. Do not buy because of low price alone. It does not pay to buy more vegetables than you can properly store in your refrigerator or use without waste. In general, many fresh commodities must necessarily be shipped in firm condition, such as pears, avocados and tomatoes. Better retailers are conditioning these products to just the stage of ripeness the consumer likes – by the time they arrive at the point of sale. Never cut a fruit or vegetable until it is ready to eat. Another genral rule-off-thumb; never attempt to cause the ripening of a product while under refrigeration. Ripen first, then refrigerate. Buy mature fruit. A green peach or nectarine, for example, will not ripen but merely soften some and wither. A cantaloupe picked too green will soften but will not be sweet and juicy. Some commodities do not gain sugar after harvest, because they have no reserve starch for conversion to sugar. On the other hand, bananas and pears gain sugar as well as tenderness after harvest. Handle with care. Fresh fruits and vegetables, because of their perish ability, require constant attention to keep their fresh appearance. The less you handle them when purchasing, or in the home, the longer their life. Don’t pinch, squeeze or poke them., for bruising leads to damage and damage results in more spoilage for you or your retailer. Check out my informational web pages on Artichokes and lots of Artichoke Recipes. Asparagus is commonly sold in bundles of about a pound, standing upright in a try of water. Select bright green asparagus with closed, compact, firm tips. A rich green color should cover most of the spear. Stalks should be almost as far down as the green extends. Try to buy stalks that are equally thick so they cook evenly. If the tips are slightly wilted, freshen them up by soaking them in cold water. Avoid tips that are open and spread out, moldy or decayed tips, or ribbed spears (spears with up-and-down ridges or that are not approximately round). Those are all signs of aging, and indicate tough asparagus and poor flavor. Check out my informational web pages on Asparagus and lots of Asparagus Recipes. Many beets are sold in bunches with the tops still attached, while others are sold with the tops removed. Look for beets that are firm, round, with a slender tap root (the large main root), a rich, color, and smooth over most of the surface. If beets are bunched, you can judge their freshness fairly accurately by the condition of the tops. Badly wilted or decayed tops indicate a lack of freshness, but the roots may be satisfactory if they are firm. Avoid elongated beets with round, scaly areas around the top surface – these will be tough, fibrous, and strong-flavored. Also avoid wilted, flabby beets — they have been exposed to the air too long. As the beet greens are very nutritious, cook them as you would fresh spinach leaves. Check out my How To Cook Fresh Beet Greens. Also check out my article on Broccoli Raab/Rapini. Look for a fresh, bright-green color, tight fitting outer leaves, firm body, and free from blemishes. Check out my informational web page on Cabbage. Select celery that is light green in color, firm, compact, and well-shaped. The stalk should have a solid, rigid feel and leaflets should be fresh or only slightly wilted. Also look for a glossy surface, stalks of light green or medium green, and mostly green leaflets. Avoid purchasing celery with bruises or discolored areas on the stalks. Celery roots can range in size from that of an apple to the size of a small cantaloupe. It is available in winter. Select firm, hard roots that are about baseball size and feel heavy. Often the bigger ones have voids or fibrous cores. If the stems and leaves are attached, they should be fresh and green. Trim side roots and leaves and store in refrigeration at 32oF. with high humidity. This vegetable does not stand up to freezing. Check out my informational web page on Celeriac (Celery Root). Check out my informational web pages on Corn and lots of Corn Recipes. Also check out Freezing Corn on the Cob. As with any root crop, look for Chinese radishes that are free of growth cracks and bruises with firm and crisp roots. Chinese radishes keep well in refrigeration if they are placed in a sealed container or plastic bag to maintain high humidity. Check out my informational web page on Daikon Radish. Smaller, immature eggplants are best. Full-size puffy ones may have hard seeds and can be bitter. Choose a firm, smooth-skinned eggplant that is heavy for its size; avoid those with soft or brown spots. Gently push with your thumb or forefinger. If the flesh gives slightly but then bounces back, it is ripe. If the indentation remains, it is overripe and the insides will be mushy. If there is no give, the eggplant was picked too early. Also make sure an eggplant isn’t dry inside, knock on it with your knuckles. If you hear a hollow sound, don’t buy it. NOTE: Whether or not there is an appreciable difference, I don’t know. Check out my informational web page on Eggplant. Check out my informational web pages on Garlic. Green beans are available year round, with a peak season of May to October. Green beans are also called string beans and snap beans. Green beans were once called string beans. Today they are string less; just break off the end as you wash them. Leave whole or cut into desired lengths. Choose slender beans that are crisp, bright-colored, and free of blemishes. Kale is overflowing with essential nutrients such as calcium, lutein, iron, and Vitamins A, C, and K. Kale has seven times the beta-carotene of broccoli and ten times more lutein. Kale is rich in chlorophyll and provides much needed fiber so lacking in the daily diet of processed food eating Americans. A leafy green vegetable starting to gain widespread attention, kale belongs to the Brassica family, a group that also includes cabbage, collard greens, and Brussels sprouts. Choose kale with small leaves as they will be tender and offer a slightly sweeter taste. Make kale leaves a regular addition to your salads. A sautéed side dish of kale, onions, and garlic drizzled in olive oil is second to none. If you are an avid juicer, you already appreciate the natural liquid vitamin content in plenty of green foods. By all means juice up the kale. One of nature’s best liquid vitamin drinks has never tasted so good. Check out my informational article on Kale – Healthy Kale and Kale Recipes. Check out my informational web page on Nutritional Data on Mushrooms. Check out my informational web pages on Onions. The skin should be smooth, with no bruises or marks on the surface. Sweet green bell-shaped peppers are the most popular garden variety. Left to ripen, they turn red, purple, orange or yellow and gain various levels of sweetness depending on the variety. Chili peppers range in hotness from mild to fiery hot. Check out my informational web page on Chile Peppers and all the Chile Pepper Recipes. Potatoes should be kept in a cool, dark place with good ventilation. The ideal storage temperature is 45 to 50 degrees F. At these temperature, the potatoes will keep for several weeks. Do not store potatoes in the refrigerator, as a temperature below 40 degrees F. will cause the potatoes to develop a sweet taste. This is due to the conversion of starch to sugar, which causes potatoes to darken when cooked. If you store potatoes at room temperature, use them within a week or so. Radicchio has a distinct bittersweet flavor similar to endive. Radicchio is available year round. When selecting radicchio, look for firm white bases. The leaves should have no blemishes, holes or browning at the edge. Choose smaller heads than you usually do for head lettuce. Although many folks that are familiar with radicchio view it as a salad component, radicchio lends itself to numerous other culinary possibilities. It is delicious roasted, grilled, braised, sautéed, stir fried, or fried. Raise the bar even higher by combining it with pasta, baking it inside a pizza crust or strudel pastry, or cooking it in a risotto until it manifests into a creamy, melting consistency. Check out my informational web page on Radicchio. Check out my informational web pages on Spinach and lots of Spinach Recipes. Summer squash includes those varieties which are harvested while still immature and when the entire squash is tender and edible. They include the yellow Crookneck, the large Straight neck, the greenish-white Patty Pan, and the slender green Zucchini. Some of these squash are available at all times of the year. Look for squash that are tender and well developed, firm, and fresh-appearing. You can identify a tender squash, because the skin is glossy instead of dull, and it is neither hard nor tough. Avoid stale or over mature squash, which will have a dull appearance and a hard, tough surface. Such squash usually have enlarged seeds and dry, stringy flesh. Also avoid squash with discolored or pitted areas. Look for full maturity, indicated by a hard, tough rind. Also look for squash that is heavy for its size (meaning a thick wall and more edible flesh). Slight variations in skin color do not affect flavor. Avoid any squash with cuts, punctures, sunken spots, or moldy spots on the rind. These are indications of decay. A tender rind indicates immaturity, which is a sign of poor eating quality in winter squash varieties. Check out my informational web pages on Squash and lots of Squash Recipes. Sweet potatoes should be uniformly light-tan-colored. Look for firm sweet potatoes with smooth, bright, uniformly colored skins, free from signs of decay. Because they are more perishable than white potatoes, extra care should be used in selecting sweet potatoes. Avoid sweet potatoes with worm holes, cuts, grub injury, or any other defects which penetrate the skin; this causes waste and can readily lead to decay. Even if you cut away the decayed portion, the remainder of the potato flesh may have a bad taste. Check out my informational web page on Sweet Potato. Tomatoes do not develop adequate flavor unless allowed to ripen on the vine. Seek out locally grown tomatoes whenever possible. They may not be as “pretty” as store bought, but beauty, of course, is only skin deep. Fragrance is a better indicator of a good tomato than color. Use your nose and smell the stem end. The stem should retain the garden aroma of the plant itself – if it doesn’t, your tomato will lack flavor and, as far as I’m concerned, will be good only for decoration! They can range in size from about an inch in diameter to the size of apricots. They are covered by a papery husk which may range from the pale green color of the fruit itself to a light grocery-bag brown. 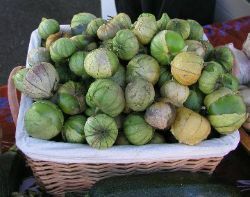 Unlike tomatoes, tomatillos should be firm and free of defects. The husks are inedible and should be removed before use. Choose small tomatillos. They are sweeter than the larger, golf-ball-size ones. The condition of the “husk” is a good indication of the freshness of the fruit. The husk should be light brown and fresh looking (not shriveled and dried). Check out my informational web Tomatillos and lots of Tomatillo Recipes.